Ready Now Blue Fawn Sable Girl Is NOW SOLD. 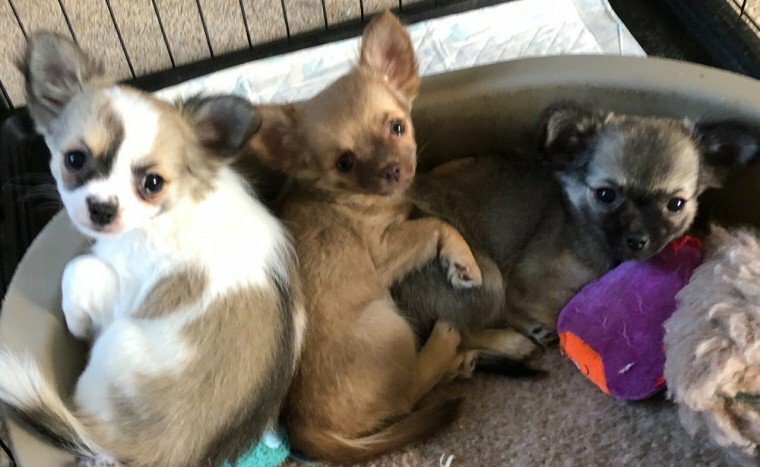 Just 2 Little Girls Left I Have 3 Kc Registered Beautiful Long Coat Chihuahua Girls For Sale. They Are All Outgoing Very Playful With Very Sweet Personalitys. They Love To Play With Other Small Dogs. They Have All Had A Full Coast Of Vaccinations And Health Cheeks. They Have All Been Wormed Up To Date. They Have Been Micro Chipped. They Have Been Flea Treated For Protection. They Will All Leave With Their Kc Registration Paperwork A Five Generation Pedigree Certificate And A Bag Of Eden Holistic Quality Dried Dog Food That They Have Been Brought Up On. Mum Is Gold With A Chocolate Nose. Mums Mum Is Chocolate. Mums Dad Is Gold. Dad Is Gold.Sable. Dads Mum Is White.Cream. Dads Dad Is Chocolate. I Have A Chocolate.Gold Little Girl With A Chocolate Nose She Is .500 NONE Kc. And .600 Kc. I Have A Blue.Fawn.Sable Little Girl..NOW SOLD She Is .550 NONE Kc. And .650 Kc. And I Have A White.Fawn.Blue Little Girl She Is .500 NONE Kc. And .600 Kc.